You remember Obelix, the wide friend of Asterix, who fell in a pot of magic potion and was doomed with extraordinary strength for the rest of his gallic adventures? Well, have you ever imagined what would happen to a video game if you dipped it into a bowl of LSD? 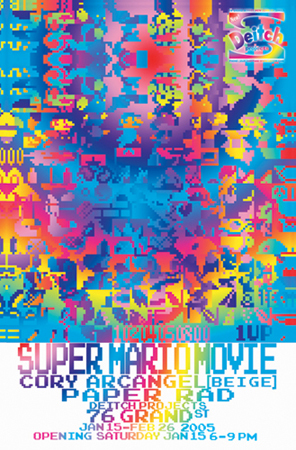 You would probably get something like Super Mario Movie, which is now playing at Deitch Projects. The project is the latest collaboration between Cory Arcangel (from Beige Records) and Paper Rad (the artist collective hallucination). 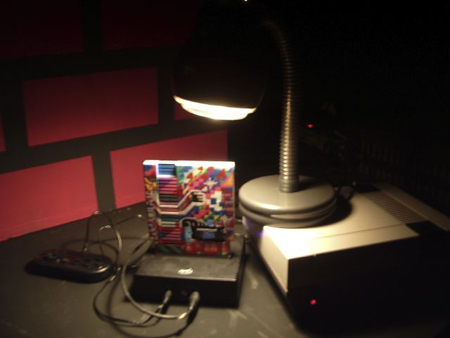 The former artist is famous in the media art arena by his hacks of old technology, including NES/Famicom game cartridges. The guys at Paper Rad are known for their production of imagery and themes that seem inspired by acid over-indulgement. 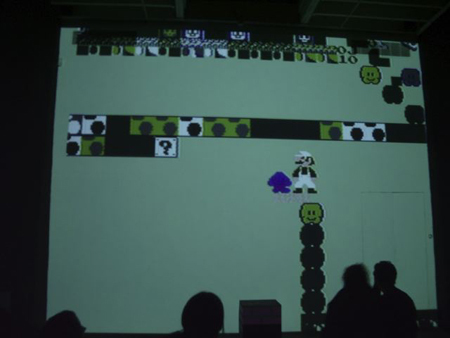 The film itself resembles the VJ set of a rave in the Mushroom Kingdom: a trippy story which this reporter didn’t follow was intermitently flashing images of a surreal, almost buggy infested Mario world to the beats of a hard old-skool NES techno. But this is no ordinary film by any means. There are no 16mm reels or DVDs to be found in the room. 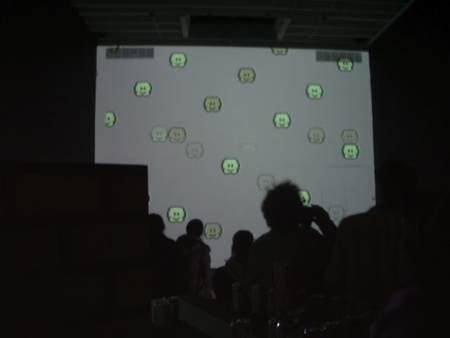 All of the images and sounds projected onto the 27ft. 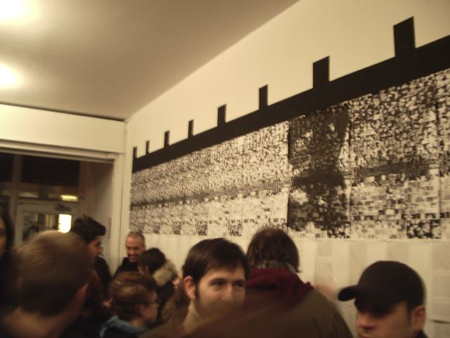 wall of the gallery come from a hacked Nintendo cartridge loaded in an old NES. The story had to be written, storyboarded and then coded into the chip of an original Super Mario Bros. cartridge, respecting the original technology constraints. Something new created from a discarded entertainment technology of the past would seem to evoke nostalgia. However the experience is quite different, like a hodgepodge of 8 bit memories with a technon hangover. Call it a retro trip, and press start.